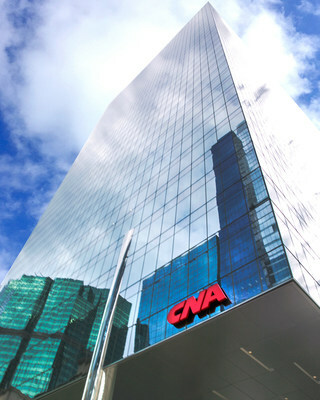 CHICAGO, June 1, 2018 /PRNewswire/ -- Today, June 1, 2018, marks the official opening of CNA Center — the new, modern global headquarters for more than 1,700 Chicago-based CNA employees, located at 151 North Franklin Street in Chicago's Loop business district. 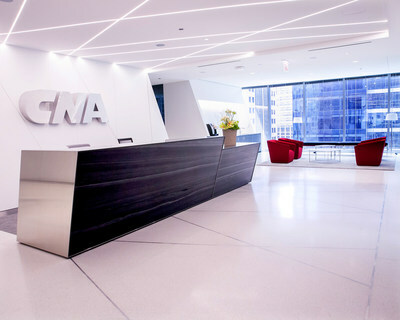 "Founded in 1897, CNA's headquarters has been located in Chicago's Loop since 1900, but this move is about much more than where we are located or a new building — it is about a workspace that enables and encourages collaboration across all functions and dimensions," said Dino E. Robusto, Chairman & Chief Executive Officer, CNA. This relocation makes it easier for employees to connect all that CNA has to offer its customers. Upgrades in technology across all locations are enabling easier, faster connections both internally and externally. CNA's network of approximately 6,300 employees, thousands of partners and 79 locations has been designed and built to better deliver products and services to customers, whether located in a major metropolitan area or a small town in any of the more than 200 countries and territories that CNA is able to serve. "CNA is known for delivering distinctive insurance solutions, and increasingly for our engagement in the communities where we live and work. Recommitting to Chicago for the location of our global headquarters was an easy decision. Chicago is a world-class city made up of diverse, vibrant neighborhoods, a multitude of cultural experiences, outstanding parks and recreation, eight professional sports teams and much more. The ease of global travel, employee commutes and the outstanding colleges and universities in Chicago and the Midwest gives companies located in Chicago a distinctive advantage for growing talent and our business," Robusto added. CNA commended John Buck, The John Buck Company and IA Interior Architects for delivering a next-generation workplace that made CNA's vision of a new global headquarters a reality. CNA's employee, department and toll-free phone numbers, as well as PO Box addresses, have not changed. The main contacts remain 800-CNA-2000 (800-262-2000), 312-822-5000 and CNA_help@cna.com. To find additional contact information, please visit www.cna.com/web/user/cna/contactus.